Thousands of demonstrators gathered in central London on Saturday to march in protest against last week's vote to leave the European Union, a result that has plunged Britain into political chaos and which most people in the capital rejected. 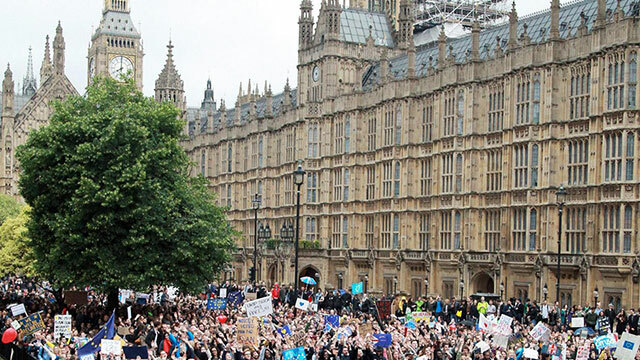 Most protestors were young adults, and many were draped in EU flags while others waved banners proclaiming slogans like "I'm with EU" or simply "Wrexit." They chanted "what do we want to do? Stay in the EU," as they set off for the Westminster political district. "I was genuinely stunned on the morning after the vote," said one marcher, Nathaniel Samson, 25, from Hertfordshire north of London. "I feel deeply uncertain about my future," he added. "I'm on the march to voice my discontentment. I am accepting the result, but it's to show that we won't accept it quietly." London voted 60 per cent in favour of remaining in the EU in last Thursday's referendum, with younger voters widely in favour of staying in the bloc, but 52 per cent of Britons overall cast ballots in favour of leaving. Rally organiser, King's College graduate Kieran MacDermott, said: "We can prevent Brexit by refusing to accept the referendum as the final say and take our finger off the self-destruct button."